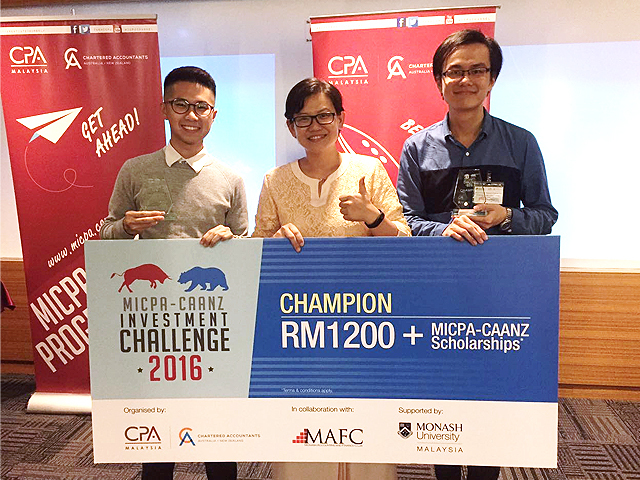 Two Accounting students from the Faculty of Accountancy and Management (FAM) were crowned Champion at the MICPA-CAANZ Investment Challenge 2016 held at Monash University Malaysia Campus on 24 September 2016. UTAR was part of the 17 universities that participated in this challenge. A total of two teams from UTAR joined the challenge. Team one consisted Chuah Chung Heng and Ivan Tay Khai Zhang, while team two was composed of Chiew Bor Jinn Eugene and Soon Yan Wen. Both teams were supervised by their advisor, Department of Accountancy Head Noreen Kong Ching Ching. The champions for the challenge were Chiew Bor Jinn and Soon Yan Wen, who won a cash prize worth RM1,200 along with MICPA-CAANZ scholarships, trophies and certificates. The challenge aimed to provide a real world experience and exposure for students about risks and returns involved in equity stocks and fixed income security trading, while developing and encouraging a culture of saving and prudent investment decision-making. At the challenge, participants enhanced their financial management and entrepreneurial skills while fostering their teamwork, critical thinking and problem solving skills. In the challenge itself, participants were given a virtual start-up capital of USD one million to invest on three levels of investment cases which cover the aspects of equity, bonds and foreign exchange. The event took place at the Monash University Sunway Simulated Trading (MUSST) lab which simulated a real world trading environment which allowed the students to experience hands-on interaction with a simulated investment activity.